A version of this story first appeared on Forbes.com. Except for the fact that in addition to a full roster of amazing clients, she just launched Amanu, a beautiful custom sandal brand. Located in West Hollywood on the corner of Melrose and West Knoll, the studio is a culmination of six months of extreme focus, three years of toying with an idea, and a lifetime of indirect, but valuable, inspiration. The idea is a fairly straightforward one, drawn from the side streets of old world cities: walk into a shop, pick what you like, and have a craftsman make it for you. It's the execution of Amanu that turns everything we're currently seeing in fashion and retail on its head. Using the same eye and style sense that has enabled her to dress some of the biggest celebrities around, Anita has pulled, twisted, and morphed all the right elements into a truly unique, human-to-human experience. While many retailers believe that more screens and less people will help them survive the current, Amanu has taken a different tack completely. A visit to the studio is filled with layers of interaction and creativity. The first step (after you pause and admire the gorgeous, serene space) is to design your own sandal. You start with a number of core styles and build from there, deciding on the sole, strap materials, and strap colors. The options are endless, making it difficult to make a final selection. Our founder Sarah was able to stop by for a visit and custom fitting, where she struggled to narrow down her selection. Ultimately she narrowed it down to three sandal styles. This summer is going to be all about beautiful sandals, and Amanu has plenty of those! After the selection process, a maker began the actual process of creation. They found the right sole and fit, took the needed measurements, and started crafting my sandals. During the process, the shoe maker checked in multiple times to ensure that the fit was just right. Before long, Sarah walked out with a new pair of sandals. In today's screen-obsessed world, we love the person-to-person interactions at Amanu and the truly customized experience. Attention to detail is everything here, and it is such a refreshing change of pace from usual shopping experiences. 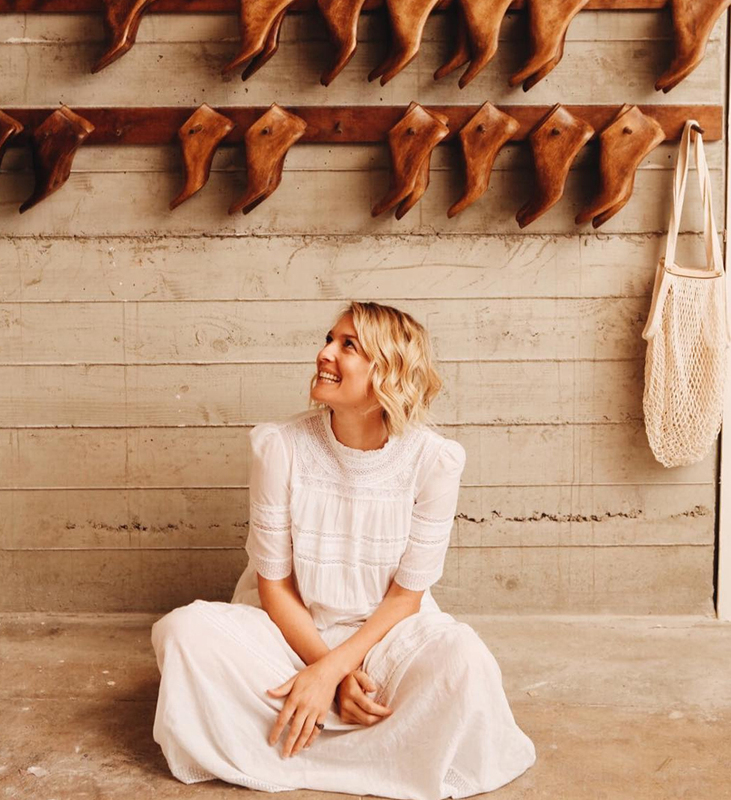 While lounging on the cushioned benches that circle the room, Anita joined us to chat more about about the brand, her inspiration, and all things sandals. SIMPLY: So, two full-time jobs, huh? Do you not enjoy sleep? Are you trying to make us all feel lazy? ANITA PATRICKSON: I think I hate sleep! ha! Actually, I have to say I have been so incredibly lucky with the people I have surrounded myself with. With all the support I have, its rounding out to one rather full on job! I am VERY good at delegating! That has been the trick. Don't hold on too tight, and hire people better than you to do those jobs where you don't excel. Knowing and being honest about your strengths and weaknesses will give you the greatest advantage. Have you received positive feedback from your clients? My clients have been AMAZING! So supportive and so so kind. They are rocking their Amanu's all around town! They've been posting on Instagram, and one of them is about to host our first dinner for us in the store! How did you move from idea to reality? Was there a moment when it hit you? Like, I need to build Amanu. Now. I had this idea in the back of my mind for a while, actually. I kept talking about it and toying with the idea until my boyfriend was like "Omg just do it already!". The moment I forced myself to start spending money and investing, that's when the ball started rolling, and it got harder to turn back. There was never going to be an ideal time to start a new company so at some point to just have to step off the cliff and make it happen. I always knew that whatever I started, I was really intent on it being something that was helping with some of the waste issues we are facing rather than adding to it and that gave me a lot of conviction in moving ahead. At AMANU we cut off only what we need for each shoe, we use brass tacks rather than glue to fix the straps in and we have a plastic free store. We aren't anywhere near where I want us to be but we are working diligently to get there. We don't totally feel like we're in a store. We feel like we could just lounge in this corner with some girlfriends for a while and it would be fine. We're guessing that was intentional? Yes! Absolutely! The core of the whole brand is based on the experience. I wanted it to feel like an escape. like you just stepped into some fabulous far off land and you could take thirty minutes for yourself to watch a skilled artisan, using an ancient technique, create something for you, that was totally custom to your feet. Or come in with a group of girlfriends, have a glass of champagne, and help each other pick out the perfect sandal. We want you to come in and feel totally disconnected with the outside world. Where are all the old Italian cobblers? How'd you find your makers? I hate to say it, but I totally stereotyped everything when I first worked on bringing this concept to life. I imagined a room full of grumpy old Italian men and in fact we have the total opposite! We have four makers, all really cool and trendy and in their 20s. They are all passionate about leather work and shoe making. Three of the four relocated to LA for Amanu. They came from Chicago and Baltimore, from corporate environments and art studios. We flew a master cobbler out from Capri to train them for a full-on two month training course and teach them the technique. We know that the whole point is that there are endless options, but if you had to choose two sandals to best define Amanu, which would they be? Oh this is SUCH a tough question! Everyday I change my favorites! I also see a totally new and fun combo on a daily basis. I would have to say that Style 2 happened by accident (me with a million things going on and ordering an incorrect width!) and its been one of our best sellers! Style 4 is actually a fave of mine this week. Flip flops are having a serious comeback, and the guinea-fowl feather flip flop is pretty epic! So we're assuming this is women's only? Honestly it's unisex but I guess we have approached the marketing towards women. We have made quite a few 'mandals' since we opened! Do you see Amanu growing into more locations in the future? What's Amanu 2.0 look like? Yes, I would love to see that! We are hoping to do a pop up on the east coast next year, either in Manhattan or the Hamptons...or both! The options are endless. It's exciting to see the potential in something like this. Let's get some styling insight here, since you are a stylist, after all! Let's say we have a wedding to attend this summer and we're planning on wearing a pretty midnight blue dress. What sandal would you recommend pairing it with? Thats the fabulous thing! You could come in with your dress and we could craft a sandal that would be the perfect match! But off the top of my head I would say Style 10 in a silver nappa would be pretty stunning and dressy enough for an event like a wedding! You can learn more about Amanu HERE! Would you ever get a pair of custom sandals?